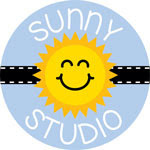 The Cast and Crew for Gina K. Designs welcomes you to another fabulous blog hop celebrating the new stamp sets by Gina K. and the illustrator team from Gina K. Designs! 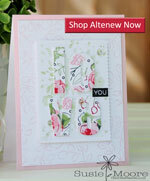 We hope to inspire you with some beautiful card projects as you hop along to each of the designer’s blogs. 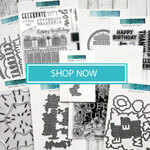 Today we are featuring the lovely new stamp sets by Melanie Muenchinger and Theresa Momber. 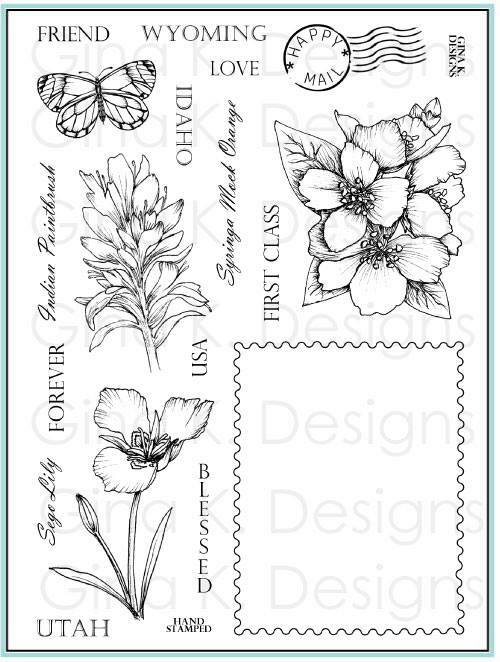 Here are the two stamp sets, which I know you will love! For my card (pictured above) using Melanie's newest stamp set, Stately Flowers 11, I used the Indian Paintbrush stamp to ink around a masked circle. Then I added an ink blended frame to encircle my sentiment (from the newest incentive set). I popped up my panel onto a white card stock base to give the card lots of dimension. I'm not sure if you can tell, but I used black foil on one of Gina's new Foil-Mates to create my background. Then I stamped the sweet daisy cluster and colored it in with Copic markers. I added some Nuvo Crystal Drops to the flower centers. Finally, I die cut the mat and daisy panel and applied them to my card base using some foam tape for dimension. So that's it for me for today, but before I go, I want you to welcome Juliana Michaels to the Cast and Crew for Gina K. Designs. Juliana has been a project designer in the paper craft/scrapbook industry since 2007 and has worked for many top manufacturers in the craft world. 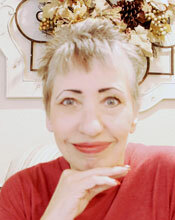 Her projects have been published in a variety of magazines and idea books. You will instantly fall in love with her projects! See you tomorrow for day 2 of the hop! Really cute cards! Love the design. 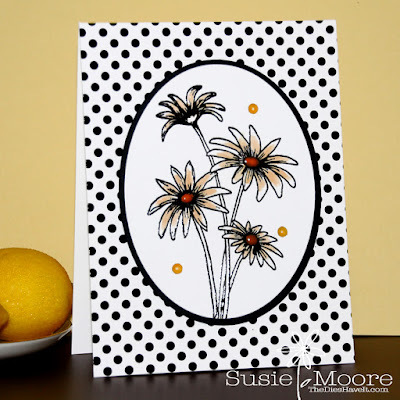 Susie- those daisies are colored beautifully. Great job on your cards. oh so gorgeous Susie! 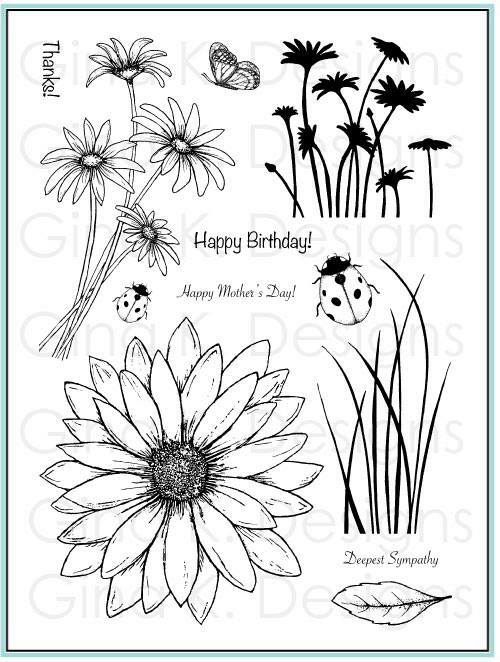 LOVE those daisies on the b/w polka dots! Lovely. I am so in love with this daisy set!! Love your gorgeous cards, Susie!!! Thanks for sharing. Beautiful cards. Such original cards! I spotted the first card with the Indian Paintbrush flower around the circle and wondered what stamp it was; now I know. Great idea. Your daisy card is beautiful. The Nuvo Drops look like sequins. Love them. So creative, Susie! I love this petal medallion you made! Your cards are so pretty! This postage stamp set is amazing! Thank you for sharing. Gorgeous cards, will be CASing these. Thanks for participating and inspiring us. Very pretty cards, thanks for the inspiration! It is all your fault that I now have Nuvo Crystal in many colors and wanting so badly the rest of the colors. Thanks. Love your samples! I really love the polkadot background with the daisies! very pretty cards. your polka dot daisies is so cute. Oh Wow! Once again you have created some wonderful cards. Amazing designs. Many thanks for sharing. Super cards. Love how you did the Indian Paintbrush. What an unusual way to use the stamp in card one. I love that idea! 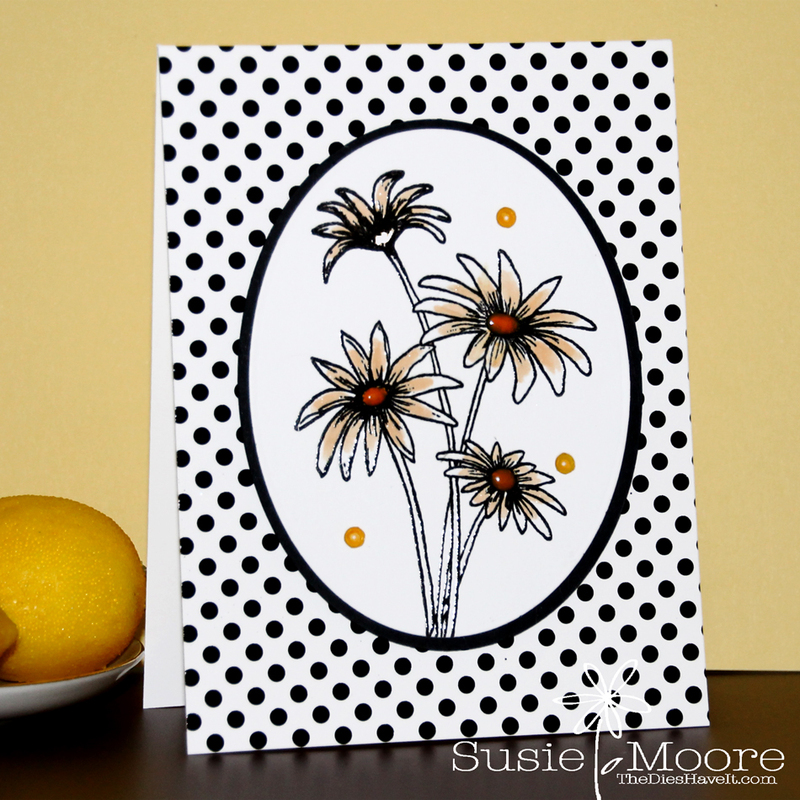 The daisy card is more traditional but I really like how the focal point oval seems to pop with the simple dot background. Beautiful job on both cards! Beautiful cards and so clever the way you used the Indian Paintbrush image to create a pattern design to showcase the sentiment. 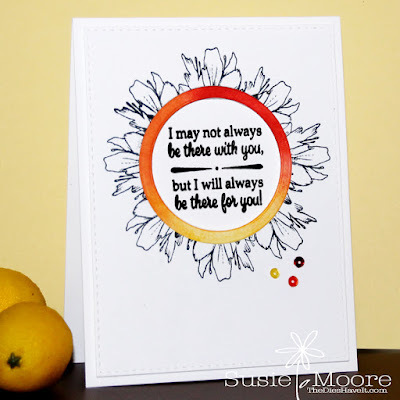 I really love how you masked off the circle and used the flower stamp. Looks completely different than just using the stamp as is. 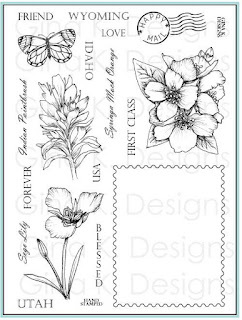 Great ideas here -- it's been fun to see everyone's creations using the same stamps and getting such different results. Thanks for sharing your techniques and talent! Beautiful cards! I love POLKA DOTS and your dotty card has me swooning!!! Great cards. I really like how you created the circle on the first card - very creative. Thank you for the inspiration. The Polka Dots!!!! So stinking CUTE! How do you all manage to make so many cards for these hops... I am in Awe. Both are fabulous cards Susie! Your cards are beautiful. I really like the daisy stamp set. Fresh. Clean. Pretty. Great designs! I love how you set your sentiment on the first card!!! And polka dots? They always win my heart! Great job and beautiful work! GORGEOUS cards, so much inspiration. Well done!!! Beautiful cards Susie, thanks for the inspiration. Love the daisies and the foil background card. Great looking cards Susie. Something about black and white that always pleasing to the eye and thanks for previewing Gina's black foil. Thanks for sharing! The polka dots are great! The daisy with the polka dots is so cute! Love the polka dots! They make everything happy! What a clever way to use the Indian paintbrush! And I absolutely LOVE your daisy card! Great use of the foil! Lovely! your cards make me smile thanks! Love your cards! 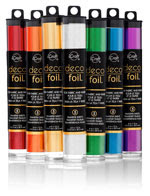 I just bought the Foil mates at the Anaheim Stamp EXPO convention so your use of the black dots for the background is a definite go for me. I love it with the hint of yellow and orange. Lovely cards. I like the sentiment on the first one. Very nice examples. Your ring of color is great. Beautiful cards, Susie! Love them both! 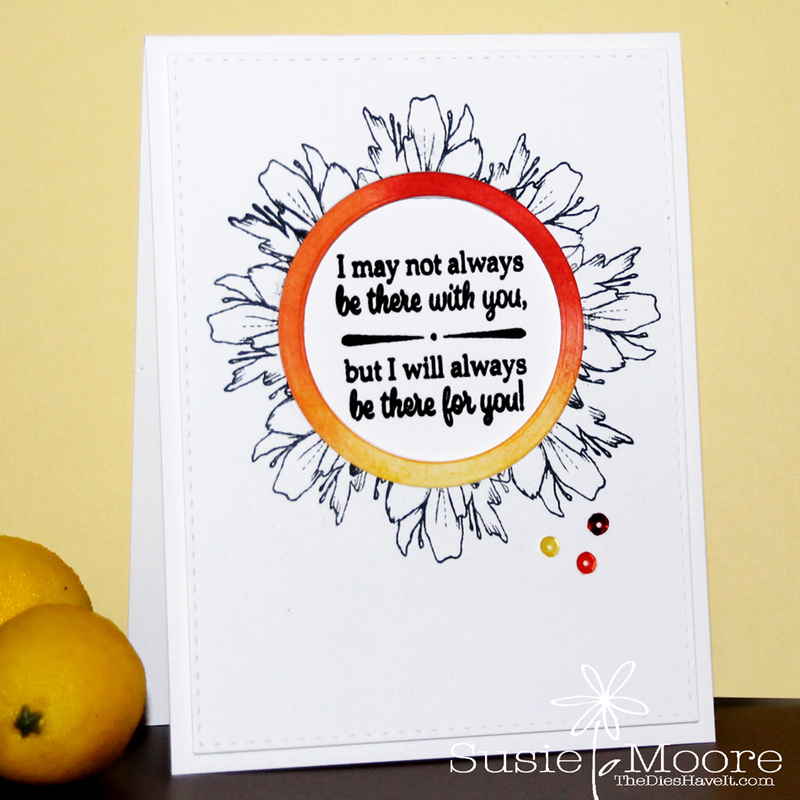 Love your daisy card! Bet it is stunning in person with all that foil! Fabulous cards, Susie. Love the daisy! Great cards and use of new release stamos. I love what you do with b & w! So striking.